St. Mary was born in Nazareth from Joachim and Anna. At the age of 3, she entered into the Temple. At 12 years of age, she was given to the care of Joseph by Divine providence. Archangel Gabriel announced to her the Incarnation of the Lord through her and she accepted. She followed her Son and God throughout His earthly preaching, Crucifixion, Resurrection and Ascension. She was also present on the Day of Pentecost. She lived with the Apostle John after her Son’s death guiding and counseling the Apostles, being their mediatress before her Son. She reposed at the age of 60. 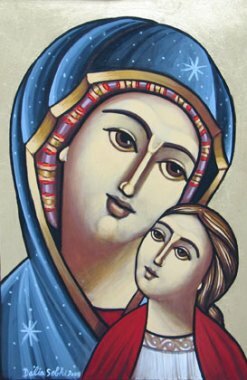 In this icon, the Virgin is on the right of Christ. She wears blue, the color of the heavenly (in other icons, Virgin Mary may be drawn wearing a red garment underneath her cloak signifying her royalty as the Psalm indicates: “..the glory of the daughter of the King is within…” (Ps. 44:13)). The stars on her vesture indicates her perpetual virginity, before during and after giving birth to Christ. In most Coptic Icons, the Virgin is always drawn carrying Christ to indicate that the honor and glory she received is because of her Son, God Incarnate.